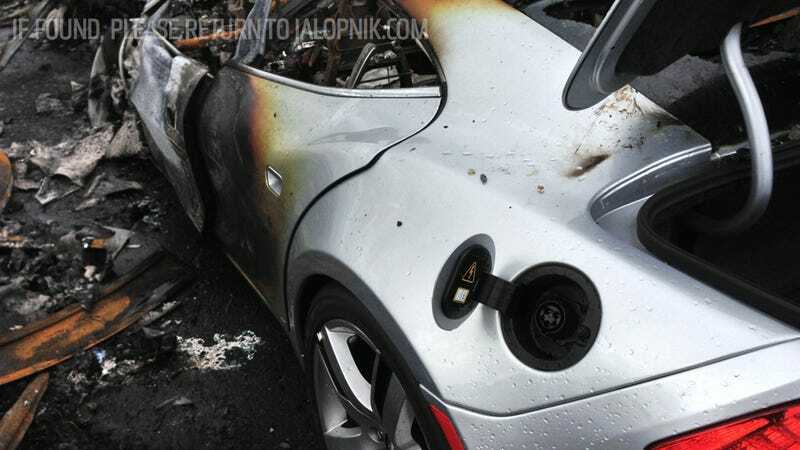 Last week we Jalopnik was the first to report on more than a dozen Fisker Karmas catching fire and burning to the ground in a New Jersey Port overrun by Superstorm Sandy's storm surge. We've now learned that three Toyota Prii burned in a separate incident at the same port. Port Newark was one of many places located along the short of Jersey devastated last week, with numerous cars destroyed after being inundated with saltwater pushed onshore by Sandy's winds. The luxury hybrid Fisker Karmas caught fire after being submerged in saltwater, although the company hasn't yet determined cause and it's unclear whether or not one car set multiple Karmas on fire, multiple Karmas burned simultaneously, or there was a mixture of sources. Our story drew lots of attention because the cars have a bad habit of self-immolating. Now The New York Times is reporting that three Toyota Prii also caught on fire. "One Prius out and out burned, the others just kind of smoldered and got really hot," Cindy Knight, a Toyota spokeswoman, said in a telephone interview with the Times. Toyota says the car that burned was a plug-in hybrid, while the smoldering cars included a plug-in and a regular Prius. They said they thought the fire was probably caused by saltwater getting into the electric system. The fires appear to be limited to hybrid vehicles with large battery packs.